Defending @AnteUpMagazine Worlds Player of the Series Dalton Still is the new chipleader with 740,000 here in Level 20. Still, also the 2016 Ante Up Player of the Year, was one of the very last players to buy in to the Monolith on Saturday, coming in from poolside to make a last-minute decision to play. 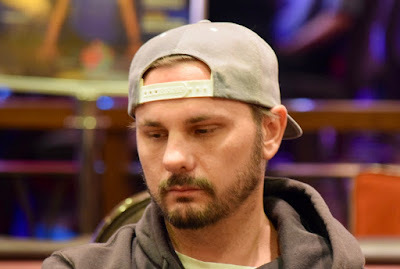 He ran that Day 1 stack up to a top-10 395,000 to begin play today and has nearly doubled so far at a starting table including Brett Murray, Chat Vitale and Donna Delfin. Murray is very close behind at 715,000 in 2bd with 60 players remaining.